Renovating a kitchen is a time consuming and expensive process. Depending on the scale and size of the renovation project, it can last several months. However, no matter the hard work it may give you initially, once the project is completed successfully, the results are worth the wait. If you’re planning a kitchen renovation or you’re already in the middle of a project, here are four essential design tips to consider. Whether you want a neutral colour palette for your kitchen or a vibrant one, choosing the right paint colour is important to compliment your kitchen design. Depending on what look and feel you want, choose the colour for your kitchen walls and cabinets. For example, if you want an elegant look, choose neutrals like white, ivory, beige, cream, vanilla or almond; for a soothing look, choose lavender, shades of pink, soft yellows, light greens or blues; for a vibrant look, choose dark contrasting colours like orange and gold, red or purple, etc. Don’t be afraid to experiment. Remember that if you don’t like the final outcome, you can always paint it again. When people enter a kitchen, the backsplash is one of those things they notice first. Replace your outdated tiles to give your kitchen an instant facelift. Over the last decade, kitchen backsplash options have dramatically become more varied. These days, backsplashes are available in various materials such as tiles, glass, porcelain, laminates, waterproof wallpaper, engineered hardwood and many more. The kitchen floor helps to define the style and function of your kitchen. If left untreated, it can become an eyesore in a newly refurbished space. The kitchen industry is constantly evolving and there are several innovative methods to create interesting floors. From a diverse range of materials, colours to patterns and textures, there’s an extensive list for you to choose from. Make your choice depending on your budget, lifestyle, style, comfort and ease of cleaning. Kitchen countertops provide a lot of opportunities to experiment with the style you want to create for your space. When choosing the colour and patterns of your countertops, make sure that they complement the backsplash, flooring and cabinets. However, opt for a countertop material based on your usage so that it can withstand the treatment for years to come. Take your pick from marble, granite, Corian, quartz, polished concrete, stainless steel, sealed wood or glass. You can go for countertop refinishing, if you don’t have the budget to replace it. It’s an economical and eco-friendly way to spruce up your existing countertop by giving it a completely new look with a wide range of finishes. Follow these tips when renovating your kitchen to boost its style and functionality. At Euroline Kitchens, we work on the principle of making the best use of your space and materials to transform your kitchens. 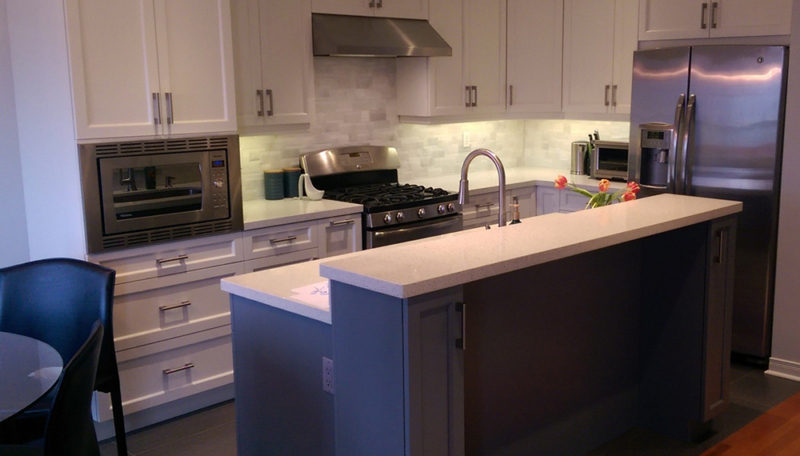 We’ve been the leading experts in kitchen cabinetry and home renovation services in the Mississauga and the GTA. Write to us for a free estimate or get in touch with us for any questions you may have.